Canzonettes for three and four voices are collected in this volume, plus Italian madrigals in the early monodic style of the continuo-madrigal. A Roman Catholic, Dering worked first in Brussels, then at the court of Charles 1 and Henrietta Maria before his death in 1630. 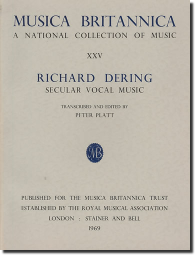 His music makes for interesting comparison with that of another recusant composer, Peter Philips, collected in MB29 and MB61 and MB75. First published in 1969, and reprinted with corrections 1977.